Oh Yeah? Well You Smell Like Hitler’s Jockey Shorts! Posted on January 23, 2006 by Mark A. 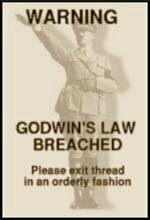 Having listened to and read many arguments between politicians and pundits I’m reminded of Godwin’s Law, which originated on Usenet. Basically the law states that as an online exchange becomes more raucous and extended over a period of time the likelihood of one participant comparing the other to Hitler or the Nazis increases concurrently. You’ve seen it happen. Someone says something like “If this were a dictatorship, it’d be a heck of a lot easier, just so long as I’m the dictator” and then someone else calls that person a Nazi. According to Godwin the person that invokes the Nazi line has effectively forfeited the argument. 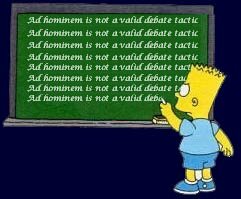 I think the same thing also applies to terrorism, and we’re seeing a lot of politicians and pundits invoke that catch-all every day. As in, if you’re not with us you’re with the terrorists, or look at them they don’t know how to combat terrorism. It’s kind of an ad hominem attack, but instead of attacking the opponent personally to derail the debate you begin an attack on that which they cannot defend: a wild opened-ended criticism without any supporting facts. You mean you don’t think we should wire-tap you? You’re a terrorist! Damn man, you just got Roved! Boo-Ya! Look at what you’ve gotten us into! Your policies actually create terrorists instead of combating them! ROTFLMAO!! That dude just got Carvilled all to hell!!!!!!!!! !